There is a fantastic pdf resource from Suffolk Maths which goes into a lot of detail on this topic – and I will base my post on their resource. Visit their site for a more in-depth treatment. How could a postman visit every letter on the graph in the shortest possible time? Above we have 3 graphs. A graph which can be drawn without taking the pen off the paper or retracing any steps is called traversable (and has a Euler trail). 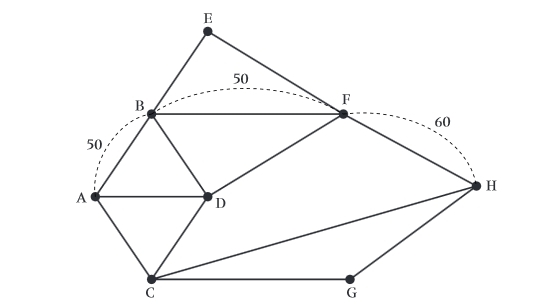 Graph 1 is not traversable. 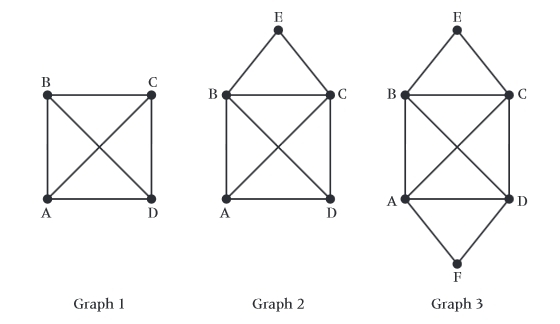 Graph 2 is traversable as long as you start at either A or D, and Graph 3 is traversable from any point that you start. It turns out that what dictates whether a graph is traversable or not is the order of their vertices. Looking at each letter we count the number of lines at the vertex. This is the order. For graph 1 we have 3 lines from A so A has an order of 3. 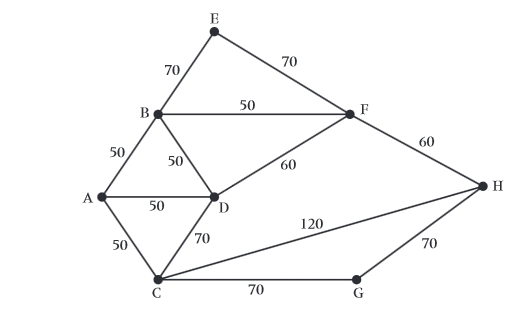 All the vertices on graph 1 have an order of 3. For graph 2 we have the orders (from A, B, C, D, E in turn) 3, 4, 4, 3, 2. For graph 3 we have the orders 4,4,4,4,2,2. This allows us to arrive at a rule for working out if a graph is traversable. If all orders are even then a graph is traversable. If there are 2 odd vertices then we can find a traversable graph by starting at one of the odd vertices and finishing at the other. We need therefore to pair up any odd vertices on the graph. Next we need to understand how to pair the odd vertices. For example if I have 2 odd vertices, they can only be paired in one way. If I have 4 vertices (say A,B,C,D) they can be paired in 3 different ways (either AB and CD or AC and BD or AD and BC) . The general term rule to calculate how many ways n odd vertices can be paired up is (n-1) x (n-3) x (n-5) … x 1. Step 1: We can see that the only odd vertices are A and H.
Step 5 and 6: The total distance along all the lines in the initial diagram is 840m. We add our figure of 160m to this. Therefore the optimum (minimum) distance it is possible to complete the route is 1000m. Step 7: We now need to find a route of distance 1000m which includes the loop ABFH (or in reverse) which starts and finishes at one of the odd vertices. One solution provided by Suffolk Maths is ADCGHCABDFBEFHFBA. There are others! Graph theory was invented as a method to solve the Bridges of Konigsburg problem by Leonard Euler. This was a puzzle from the 17oos – Konigsburg was a Russian city with 7 bridges, and the question was, could anyone walk across all 7 without walking over any bridge twice. By simplifying the problem into one of connected lines, Euler was able to prove that this was in fact impossible. Knight’s Tour – This puzzles dates over 1000 years and concerns the ways in which a knight can cover all squares on a chess board. Game Theory and Tic Tac Toe – Tic Tac Toe has already been solved using Game Theory – this topic also brings in an introduction to Group Theory. But Konigsburg was Prussian not Russian for most of the 1700s (and all the time before Euler proved the walk was impossible). It was Russian later for about 7 years and again from 1945. Thanks for the simple tutorial. 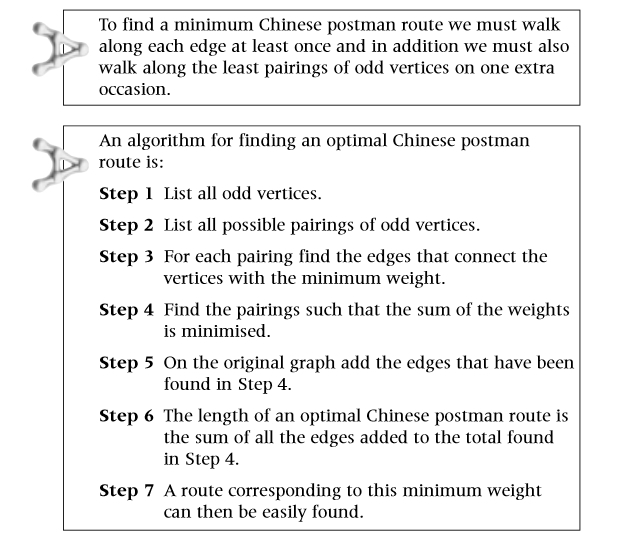 The chinese postman problem gets difficuilt to solvr if there are more than 2 odd nodes.. It wud really be nice of u, if u cud put an example of that case too.. Thanks friend, this was really helpful! I hope that you are well and continue to create such amazing examples, friend. Hasn’t someone made progress on this recently? It’s very similar to the traveling salesman problem.